Located in One Loudoun Shopping Center, three miles from Dulles Airport. This spacious location has indoor and outdoor spaces to accommodate all event needs. The Barrel Room accommodates 55 guests seated or standing, reception-style. The mezzanine accommodates 70 guests seated, or 100 guests standing, reception-style. Patio A accommodates 30 guests seated, or 40 guests standing, reception-style. Patio B accommodates 40 guests seated, or 50 guests standing, reception-style. Tour the space! Bubbling, thin crust pizzas, mini burgers, crisp salads, and craft cocktails...four great reasons to visit matchbox today. 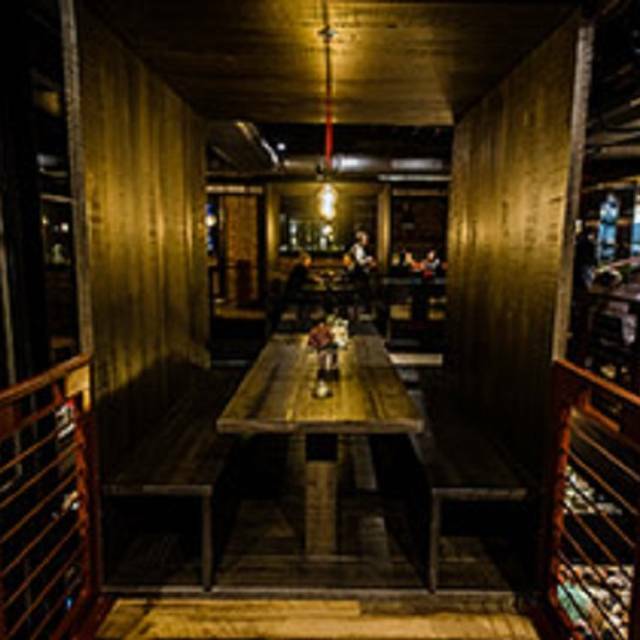 We’re Ashburn's neighborhood gathering place for fun, upscale casual dining, with local, award-winning beers, broad spectrum wines, and handcrafted signature cocktails you won’t find anywhere else. In the heart of Loudoun County is our dining oasis with two light-filled levels--each with shaded outdoor patios for great people-watching. This spacious location has indoor and outdoor spaces to accommodate all event needs. The private Barrel Room accommodates 55 guests and comes with comfortable seating, a wood-burning fireplace and private wine coolers to store your favorite vintages. Loved the new menu items! Sunday brunch was excellent! A new discovery and we will return. Food delicious..service excellent. Had 2 birthday guests.. A Little disappointed no treats for them. We were doing a hit-and-run on the way to the movies and had a server in training. She was fine and got help from an experienced server. Shrimp and grits appetizer was just what I wanted, pizza (Spicy Meatball) reviews were good. Nice Manhattan. A bit pushy on the upsell despite telling them several time we had a limited time window and weren't going to be ordering more. Still, I'd go back. Pleasant time. Service was disappointing. Had requested a more quiet location in Open Table and they wanted to seat us in the bar. When we were finally seated in another room it took a good 20 minutes to get our drinks. Food was ok but I ordered the steak salad and got 5 or 6 small bites of steak for $22. Won’t go back. Made reservations. Asked to be seated outside. Was told the wait was 5-10 minutes for setting up table and waters. Didn’t have waters when we got to table. Food was good. Drinks were good except a miss pour of wine. We will definitely go back. Appetizer portion smaller than expected. Pizza was amazing. Quick service. The music in the bar area was too LOUD. It affected conversation at my table in the restaurant area. Way too pricey for this type of restaurant. The best part of the meal was the bread, so what does that say. Shrimp and grits appetizer was good, but I have had better as an entree at other restaurants for the same price. Pizza mediocre for the price. The same could be said for the burgers. Fries the same as I can buy at the supermarket in frozen foods. Drinks ok. Not a great pour on the martini and 3 attempts made to get a soft drink order right. Bartender never noticed syrup was missing from the drink and it was just fizzy water. Brunch offering is just plain silly. $31.50 for all you can eat, and still pay for bloodys and mimosas. For someone like me, who only eats an appetizer for my main course, it would be ridiculous to spend that much money and just eat an omelet or chicken and waffles. WHY not make the brunch ala carte???? Thought we would try something new, but big mistake. Server was great though. It is a great place for happy hour - fun, great music, big appetizers, cold beers, etc. I was disappointed that they changed the bread for the spinach dip (Mosaic location had a crustier sliced bread that was simply delicious). Also the sliders were not as tasty as the ones at the Mosaic location - the fried onions were really greasy and not crunchy and the sliders themselves were quite dry (not enough cheese). The shrimp and grits was the best dish. The food was good. The tartar tacos are always a go to for us. The cocktails are excellent. We were seated almost immediately as we arrived right in time for our reservation. It was a busy Saturday night with lots of families, so it was a little on the loud side but not too bad. It was mostly the occasional high pitch sounds coming from the cartoons a few of the children were watching on devices. We had a party of six upstairs near the kitchen entrance. My son and I both order the filet mignon medium rare. My son's filet came out so rare to the point it was cool in the middle. The management apologized and cooked another one. The second one came out the same as the first...rare. My filet was overcooked to the point of being well done. I just ate it. We will never return. Section we sat in was cold, many had jackets on or were asking to move. Very uneven temps throughout the restaurant unnoticed when visiting restrooms. Service was very good but food was just OK so not worth price. Kitchen went crazy with the old bay seasoning on fries and wings we ordered. I want to like this place but I’ve come to the determination that few places in One Loudoun are worth the prices they charge. We were seated right away. We had an excellent server. We told our server we only get together once a month and we like to sit and talk. He hardly came over except to see if our food was ok, to fill our glasses and to see if anything else was needed. This is the first time I've dined at Matchbox that I thought the food was not quite as good - that apple/cheese salad is usually good- the lettuce wasn't as good this time and the dressing not as good. The sliders were not hot and were somewhat dry/overcooked. Server was wonderful. Nice local restaurant. Great service (by Cristian), good value. Fantastic restaurant with really good menu options for anyone. They have gluten free options, great pizza, drinks, salads are amazing! Our server was so great and the manager checked in on us as well. This is a very busy restaurant and they are managing it all very well. The food was very good. However, the service was the worst I've ever had at the table. We sat at the bar first, and the bartender was awesome. I wish I knew his name to give him credit. As soon as I walked into Matchbox, I was very comfortable. 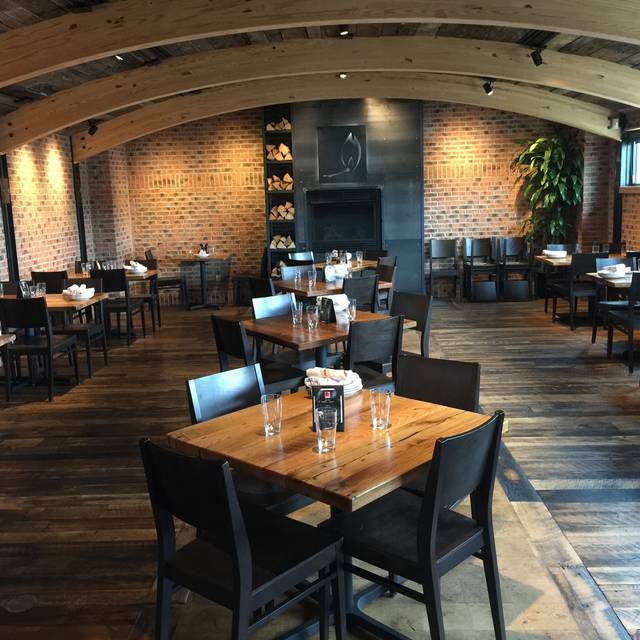 Perhaps it was the wood-fired pizza oven or the sight of all of the firepits, but it just felt warm and inviting. Decor is like an old well-kept barn, and the service was fast and friendly. We had 6 burgers (mini, they come in 3,6 or 9) and a large pizza. The burgers were great and the pizza had a zing! Great the next day as leftovers. We will definitely go back! The food was great there! So were the cocktails. The bartender could have been a little more attentive but thats no big deal. We had the calamari and spinach/crab dip, the dip was delicious ...the calamari was too greasy. We were served our appetizers without utensils/napkins. Took the servers 5 min to retrieve two sets for us.. The ambiance is really fun, however, the bathroom was poorly kept, 2 of the 4 stalls were flithy...toilet paper and personal hygiene products on the floor...etc. Made a reservation for 7:45. Table not ready. 30 min wait. Host and hostess told that it was two birthday celebrations! Not recognized by anyone. Placed by a table with screaming children that I asked several times to be quiet. Also asked their parents to quiet their children to no avail. I’m usually a fan but food was just ok this time. The Cobb salad had way too much dressing mixed in it. It actually gave me a stomach ache for a bit afterwards. And the rose sangria was bitter and the pulp from the strawberries kept clogging up the straw making it impossible to drink. It was probably the only cocktail I’ve ever ordered and barely touched. My mom really enjoyed her fried calamari and chicken sausage soup though. Our waiter was very attentive and accommodating to my mom asked for a different dip for her calamari and cheese for her soup. 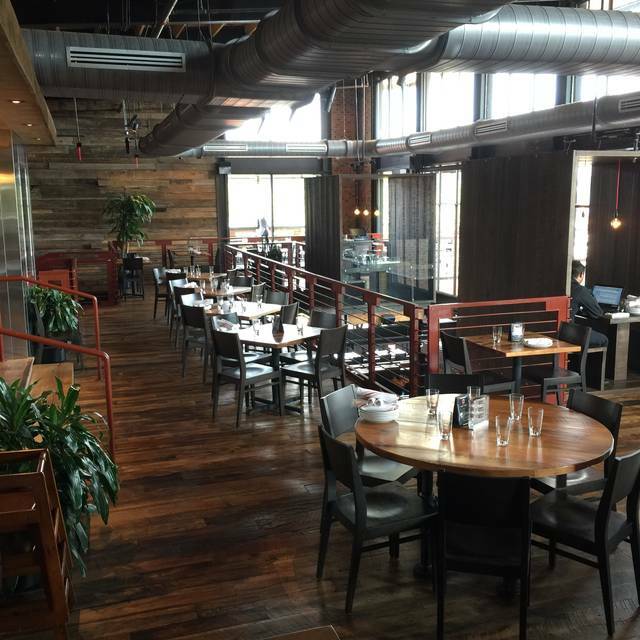 I enjoy the food at Matchbox and service is always good, and sometimes really excellent. This visit, we were seated upstairs (a first) and the restaurant is a very energetic noise level throughout...music, open concept, wood and steel...but upstairs it was nearly impossible to hear anyone across the table speak. Real bummer that the tradeoff for the cool urban design is such booming noise and nothing to dampen all that sound. I would not recommend going there if you're hoping to have great conversation...but if you're with a group you're okay not hearing- it's a tasty place to dine!! Service was very good and the chef had a special of Pimento cheese .....it was superb...it should be a regular on the menu with the bread! It was terrific as usual. A bit busy so service wasn’t up to it’s normal par, but was still good. Noise level is nuts, but we don’t care. It’s just a super nice friendly restaurant that we frequent often. Our first time to Matchbox! We were pleasantly surprised that everything we tried was amazing! And when we weren't sure which to pick, we resorted to recommendations from our server who was on point every time. The only thing that was a negative was the price of some of the items. We had a pretty hefty bill at the end of the night. But I would still recommend this spot and will definitely be going again! Service was slow and they messed up the order- twice. Wrong entree came out. Was told something was gluten feee and it wasn’t. Very loud, crowded restaurant. Hard to hear your table speak. Tables too close together. Food (pizza & salads on this visit) and house wine are outstanding! This is about our 5th visit and it's a very busy restaurant but they seem to manage the crowd pretty well. We made the reservation on Open Table and were seated in the bar without being asked if we were ok with that. Initially we were not ok with it, as it was super loud and there were 3 of us wanting to talk. However, Nathan was our server and we quickly decided we'd deal with the loud noise just to have him as a server. He was excellent - so friendly, organized, knowledgeable about the menu and wine, etc. He really changed that situation right away so overall we were very happy! I would just suggest maybe asking people first if they are ok with that atmosphere - it's not for everyone, especially when you make a reservation in advance. Very busy place. Sat us within 5 minutes of our reservation time, so that was good. However their food order/prep/ delivery processes are overwhelmed. One of our four meals never showed. The BS excuse was that it was "lost by the kitchen". How does that happen? They also delivered an appetizer we never ordered. On top of all that, our server had horrible body odor. The fact that he had to come back multiple times due to the missing order only made it worse. To give some credit.. the manager came over to apologize for the missing meal, and then got it to us. Did not charge for that meal, the extra appetizer and bought my wife a another glass of wine. We were there late afternoon on a Saturday. Service was slow and not great for what appeared to be a slow or less busy time of day. Food was good -- calamari was the best we've had recently and pizzas were good. The list of cocktail drinks to pick from was different, kind of strange, and not very tasty. We tried the Bourbon Crisp (kind of different), an Old Fashion (overwhelming with the cherry taste), a Mojito (too tart), and ordered a regular margarita (which is not on the menu and even with Patron was not good) and a vodka/cranberry which was the best of the day. Drinks were way overpriced certainly considering that we did not find any that we would order again. We had a great date night at Matchbox. The service was amazing, our waiter was extremely friendly, and our food came out super fast. We ordered the meat pizza and tuna tacos (appetizer) and they were both AMAZING. Will definitely be dining here again soon!